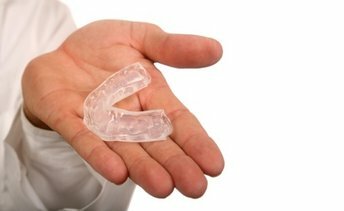 Mouthguards are trays worn over teeth and are typically used to protect teeth from injury during contact sports and from habitual tooth clenching and grinding. Mouthguards can also be used to relieve jaw pain related to TMJ issues, and can be helpful in controlling loud snoring while sleeping. A custom fit mouthuard is designed in the dental office or in a dental laboratory, depending on each patient’s specific needs. An impression of your teeth is made and the mouthguard is then fabricated over the model to provide the best fit and protection possible. Mouthguards can be made in materials that are soft or hard, and they can be clear or in a team color for our athletes. Mouthguards are easily cleaned with cool, soapy water and left to air dry. Custom fit mouthguards for sports and physical activities can limit risk of injuries to lips, tongue, and teeth. For habitual tooth grinding, mouthguards help avoid chipped teeth, superficial cracks in tooth enamel, fractured teeth, nerve damage to a tooth, and tooth loss. Call Thomaston Dental Associates to schedule your appointment for your consultation and mouthguard impression today!